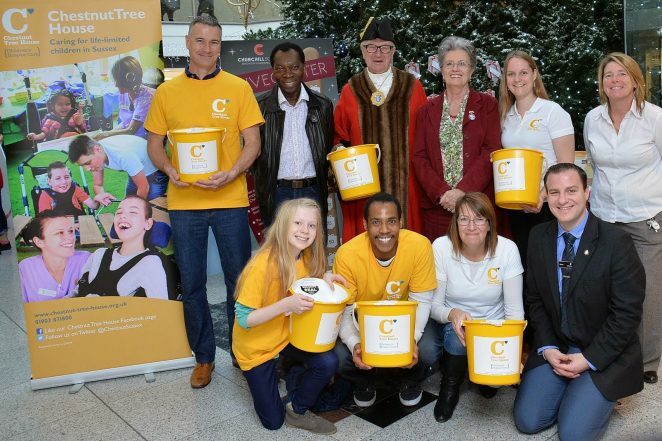 Visitors to Churchill Square today saw the Mayor of Brighton and Hove, Councillor Brian Fitch, officially launch the beautiful Giving Tree which is covered with gift tags containing Christmas wishes from individuals who use the services at Chestnut Tree House. Chestnut Tree House is the only children’s hospice in East and West Sussex and cares for 300 children and young adults from birth to 19 years of age, with progressive life-limiting conditions and life threatening illnesses. Brighton shoppers are being asked to pick one of the gift tags from the Giving Tree, and when buying a present for a loved one, to buy an extra present to help make a child’s Christmas wish come true. If you would like to brighten the Christmas of a sick child, the Giving Tree will is located in the lower mall at Churchill Square and gifts will be gratefully accepted until December 23rd. All the presents will be distributed on Christmas Day. If you would like to find out about the wonderful work of the Chestnut Tree House hospice, please visit their website here.